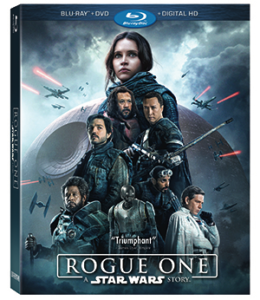 Lucasfilm’s Rogue One: A Star Wars Story is now out on Blu-ray/DVD (April 4th)! If you haven’t seen it yet, this one is a MUST own for your Star Wars collection (you can read our Rogue One review here)! It was really good, so we were thrilled to get a review copy to have on Blu-ray at home! For those not familiar, the movie centers all around the Rebels trying to steal the plans for the Death Star! 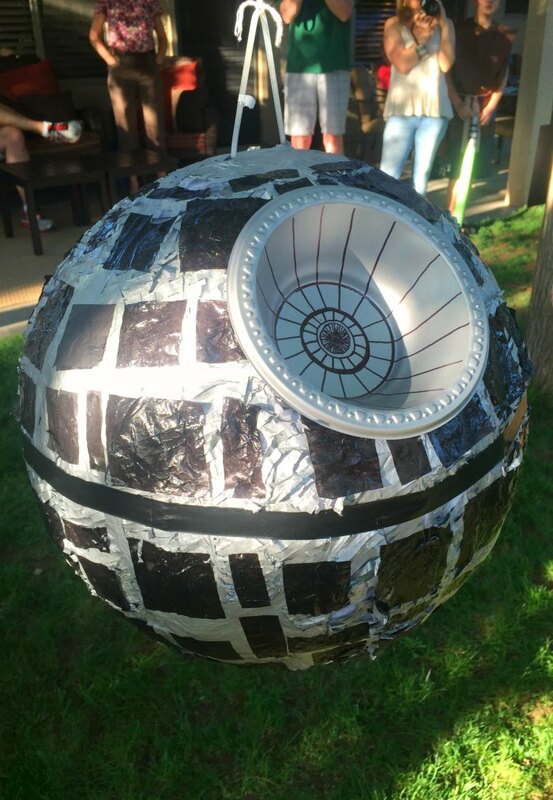 So, I thought this was the perfect time to share all about making the Death Star piñata that we used for the boys’ Star Wars Jedi Training birthday! Start by cutting a whole piñata large enough to fit the bottom of the bowl (this will become the laser weapon portion). Stick that into the piñata, using glue if desired/necessary. 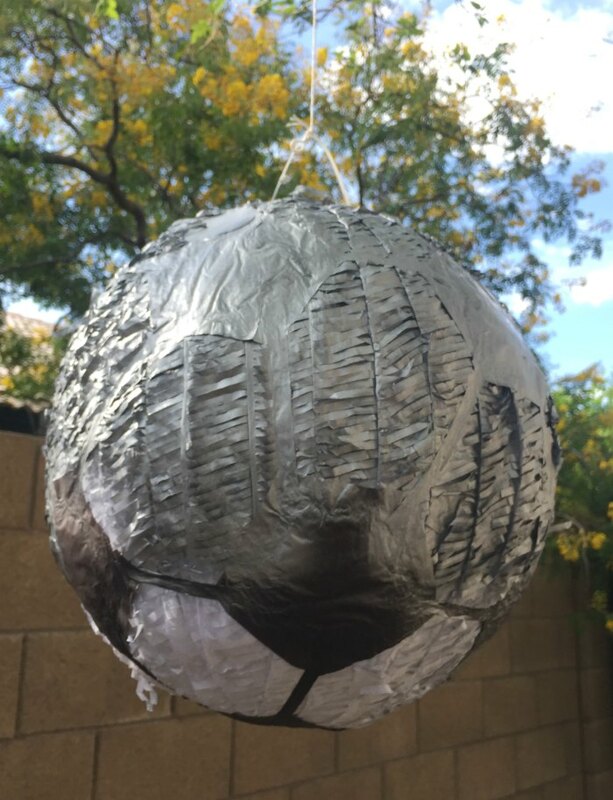 Then, use your gray/silver spray painting to cover the entire piñata. While that dries, cut different square and & rectangle shapes out of black tissue paper to make some of the Death Star shapes. Once dry, make two hemispheres with the black tape. Then, use the mod podge to start sticking on all your shapes. Since tissue paper is thin, a very thin coat of the mod podge is all you’ll need. Remember, you don’t need perfect here -the kids will love it. So, just slap the shapes around each hemisphere in some patterns that resemble the Death Star. Lastly, use a black Sharpie to draw the lines in the area for the super laser! This part really helps make it look like the Death Star! Then, it’s ready to party & enjoy! 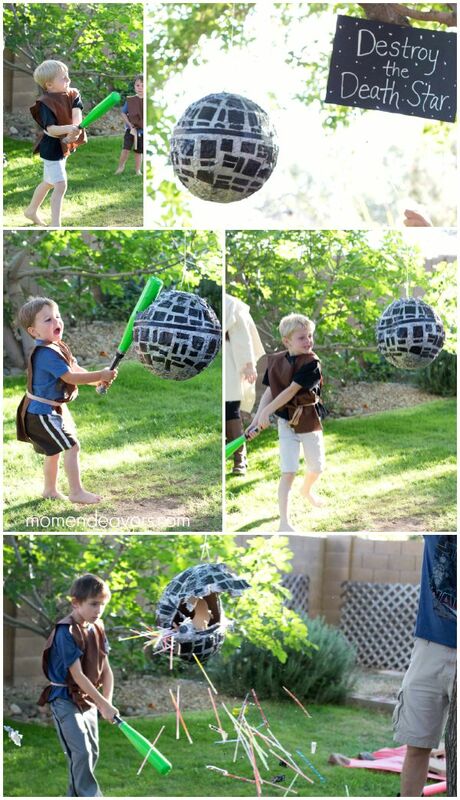 It was a HUGE hit as part of the boys’ Star Wars birthday party! 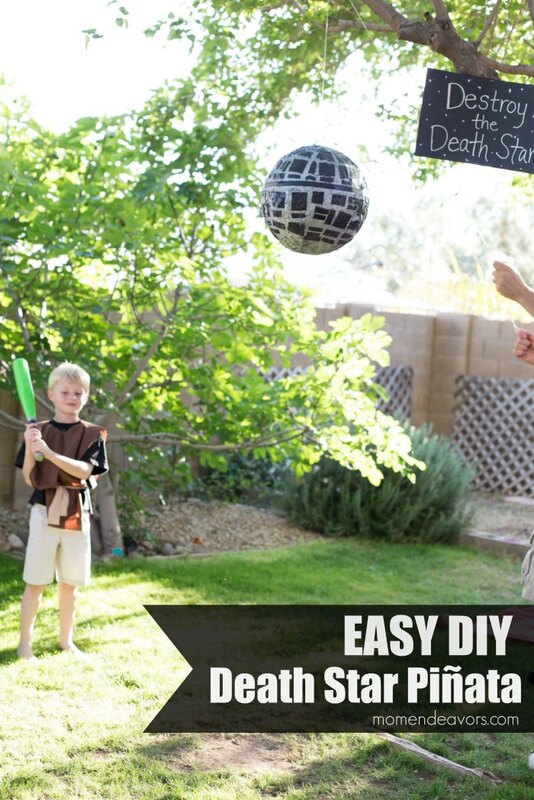 But, it could even be something extra fun for a Rogue One Star Wars movie night!!! So, be sure to buy your copy of Rogue One: A Star Wars Story on Blu-Ray/DVD (affiliate link) and enjoy! We love having the movie at home! Plus, the bonus features are so much fun! A Rogue Idea – Hear how ILM’s John Knoll came up with the movie’s concept – and why it’s the right film to launch the Star Wars stand-alone films. Jyn: The Rebel – Get to know Rogue One’s defiant, resourceful survivor, and hear what it was like for Felicity Jones to bring her to life onscreen. Cassian: The Spy – Diego Luna shares insights into his complex, driven character, who becomes a hero through selflessness, perseverance, and passion. K-2SO: The Droid – Explore the development of this reprogrammed Imperial droid, from initial pitch and character design through Alan Tudyk’s performance. Baze & Chirrut: Guardians of the Whills – Go deeper into the relationship between these two very different characters, with Chinese superstars Jiang Wen and Donnie Yen. Bodhi & Saw: The Pilot & The Revolutionary – Forest Whitaker and Riz Ahmed reflect on Saw Gerrera, the broken Rebel leader, and Bodhi Rook, the Imperial pilot who defects. The Empire – Meet a dangerous new Imperial adversary…and cross paths once more with the most iconic villain of all time. Visions of Hope: The Look of “Rogue One” – The filmmakers describe the challenges and thrills of developing a bold new look for the movie that can fit within the world of the original trilogy. The Princess & The Governor – See what it took to bring the vibrant young princess of “Star Wars: A New Hope” – as well as one of her most memorable foes – back to the screen. Epilogue: The Story Continues – Filmmakers and cast celebrate Rogue One’s premiere and look forward into the future, to the Star Wars stories yet to be told. Rogue Connections – Uncover Easter eggs and film facts hidden throughout the movie that connects “Rogue One” to the Star Wars universe.